Osinbajo, Emir of Kano meet in Aso Rock – Royal Times of Nigeria. The meeting which took place at the Vice-President’s mini conference room, lasted for about two hours. When accosted by State House correspondents, the Emir declined to comment on the outcome of the meeting. 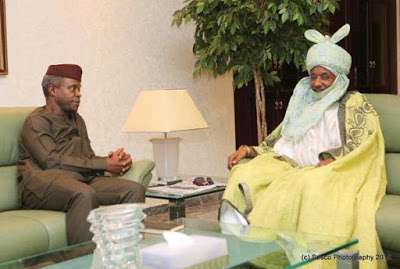 Acting President Yemi Osinbajo on Thursday met behind closed doors with the Emir of Kano, Malam Sanusi Lamido Sanusi, in the Presidential Villa, Abuja. The News Agency of Nigeria (NAN) reports that the meeting which took place at the Vice-President’s mini conference room, lasted for about two hours. 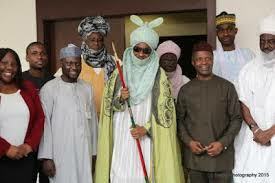 When accosted by State House correspondents, the Emir declined to comment on the outcome of the meeting. However, NAN reliably gathered that the Emir was on a “Thank You’’ visit to the acting president, who recently joined other well meaning Nigerians to stop the Kano State House of Assembly from its investigation of alleged misappropriation of funds and other infractions levelled against the Emir. It would be recalled that the House resolved to drop the probe following a plea through a letter by Gov. Abdullahi Ganduje of Kano state. The letter was read by the speaker, Kabiru Rirum, on the floor of the House. In his letter, Ganduje said he was calling for the investigation to be dropped as a result of interventions by highly-placed personalities in the matter. According to the letter, the personalities include the acting president, Prof. Yemi Osinbajo; party leaders; former military President Ibrahim Babangida; former head of state Abdulsalami Abubakar; Sultan of Sokoto, Sa’ad Abubakar; and businessmen and indigenes of the state, Aliko Dangote and Aminu Dantata. NAN gathered that the Emir’s visit to the Presidential Villa might be part of the ongoing consultations by the acting president with stakeholders which began with foremost Leaders of thought from the Northern and South East States of the federation. The consultation was sequel to the calls for secession by youth from different ethnic groups in the country resulting in some asking others to vacate their region before Oct. 1.